A quick fresh and delicious summer salad. 1. 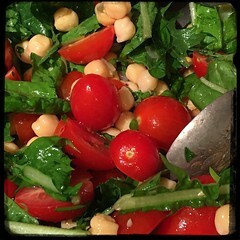 Toss the chicory (or radicchio), basil, flat-leaf parsley, chickpeas, tomatoes, green onions together with the olive oil, vinegar, salt and pepper.